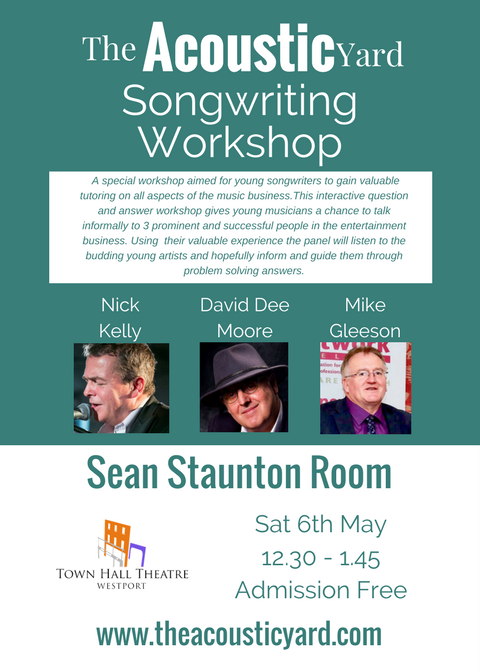 The Acoustic Yard are putting together a free workshop aimed for young songwriters but everyone is invited on Saturday May 6th 12.30pm as part of it’s festival in the Sean Staunton Room of the Westport Town Hall Theatre. The event is organised to help participants to gain valuable tutoring on all aspects of the music business. This interactive question and answer workshop gives young musicians a chance to talk informally to 3 prominent and successful people in the entertainment business. Using their valuable experience the panel will listen to the budding young artists and hopefully inform and guide them through problem solving answers. The panel will also select a few people in the audience to perform a track for appraisal and guide the songwriter in the do’s and don’ts of recording, performance and promotion. This is a unique opportunity for young musicians to move forward to the next step and gain some valuable help. The Workshop will be conducted in 3 parts, each lasting around 20 mins long including Songwriting and Production, Performance and Gig Organisation and Social Media Presence Using Video and Visual Aids. The panellists will listen to songwriters in the audience and offer a broad critique and advice in all aspects of their song. Structure, Melody and Production techniques with Pro Tools etc to bring the song to the next level. The panellists will listen to questions from the room and offer advice to performers in voice and instrument techniques and communicating with your audience. They will also offer help in finding gigs, talking with agents, PR and record companies. Social Media Presence Using Video and Visual Aids. Using Social Media as a tool in getting your music out there via Soundcloud, YouTube and Twitter. The use of video in recordings, how to create your own simple video. Nick Kelly is a Choice Music Prize nominated solo artist. Having previously penned and sung some of Ireland’s most popular songs including ‘Arclight’ and ‘Dronning Maud Land’ with Fat Lady Sings he was voted #3 Best Irish Songwriter in Hot Press Readers Poll (after Hozier and Damien Rice ) This all coincided with the release of his latest album ‘Loads’ under the guise of Alien Envoy. In recent years Nick has become an Oscar- Shortlisted film-maker (for 2011’s action short ‘Shoe’) and will be released his anticipated first feature ‘The Drummer and the Keeper’ this year. Other work that Nick had been involved in include a host of famous advertisements for Guinness, AIB, Airtricity and the Carbon Monoxide Awareness campaign. Mike Gleeson runs the successful music agency Downda Road Productions which is a record label, music production and management company whose core goals are to discover, nurture and develop emerging talent. In doing so, he likes to grow with the artists, developing steady fan bases and the artist’s confidence, allowing them to shine on a broad platform. He puts the time, attention and effort into these budding artists so that down the road they can see them achieve a long lasting and successful music career. ‘Downda Road Productions’ based in Naas Co.Kildare have on their books the Westport based Grainne Fahy and Keith Plunkett from Ballyhaunis, the later has just released his ‘!00 Craics’ single which helped to him to be named as Today FM’s emerging young artist. David Dee Moore is a singer/songwriter, producer, festival organiser and radio presenter. With 35 years of musical experience including recording 3 albums and touring the world with Niamh Parsons and the Loose Connections, being signed to numerous record companies and working on hundreds of recordings. His vast knowledge has been invaluable to young songwriters and musicians through his music classes in Westport. Blues and Roots Radio (www.bluesandrootsradio.com) which has 200,000 listeners earmarks his show as the definitive songwriters show weekly has been lauded as a valuable platform for songwriters around the world.